When I was in high school, I sang in the choir. The choir director was Mr. V., a man diminutive in stature but not in ego. Mr. V. threw theatrical tantrums during rehearsals, tearing up sheet music, throwing chairs, and sarcastically berating students whose pitch was off or whose entrances were late. “I could drive a truck through that vibrato!” he would bark at a wobbly soprano. The rest of the students watched these theatrics with awed gratitude that it was someone else, not us, feeling the hot humiliation. I didn't fit in with the choir's culture. I wasn't invited to the parties, didn't have friends and romantic flings with the other choristers, my parents weren't involved in the parents' organization, and I didn't grow misty, as others did, during the choir's traditional pre-performance ritual of holding crossed hands, swaying and singing the prayerful song written by a choir alumnus. I could sing, though, and I loved doing it. When I auditioned in my junior year for the choir's annual production of a Gilbert & Sullivan operetta, the other singers were surprised that I, a relative nonentity, won a role. It was a small part with only a few solo lines, but it opened a floodgate of rage from Mr. V. “No No No!” he would scream, stopping the rehearsal because my entrance was a beat too late, I didn't sing it right, or because he didn't like the way my costume looked. He literally jumped up and down on the stage castigating me, my appearance, my singing and my very existence, while the rest of the cast looked on. As part of the chorus, I had to dance with Keith, a popular upperclassman. As we stumbled through our steps, Mr. V. stopped the rehearsal to scream at me and my reluctant partner. “You two need to go out and get some practice,” he said, swaying his hips lewdly. I felt the heat rise in my cheeks. The film started as an 85-page screenplay that gained notice on a list of top screenplays not yet produced. Writer-director Chazelle adapted part of it into an 18-minute film that screened at Sundance and sparked interest by investors, who financed the full-length feature. The excellent character actor J.K. Simmons reprises his role from the short film as teacher-conductor Fletcher, and young Miles Teller was cast as Andrew Neyman, the ambitious student drummer. Teller, so impressive in THE SPECTACULAR NOW, has sad-looking Buster Keaton eyes and a serious face that conveys Andrew's determination to be as good as his idol, Buddy Rich. Andrew is enrolled at the fictional Shaffer Conservatory of Music, described as “the best music school in the country,” so maybe read it as Juilliard. He lives in a shabby room and goes to the movies every week with his very nice dad (Paul Reiser). He has his eye on a pretty girl, Nicole (Melissa Benoist), who works at the concession stand, and shyly asks her out on a date. Simmons, muscular in a black t-shirt, a ropy, throbbing vein visible on the side of his famously bald head, is so perfect as this foul-mouthed martinet that an acting award is all but inevitable. The movie harks back to the movie trope of the sadistic drill sergeant (A SOLDIER'S STORY). The stories are similar; the abusiveness is so extreme it leaves the audience hungry for vengeance. Andrew's initial response is to practice like a demon, until his hands literally bleed all over the drum kit. He breaks up his promising relationship with Nicole, explaining that dating her will keep him from his goal.“I want to be great — one of the greats,” he explains to the hurt girl. Andrew believes what Fletcher has told him: that Charlie Parker became “Bird” because one day in rehearsal, drummer Jo Jones threw a cymbal at Parker's head after he missed a beat, and that motivated Parker to practice obsessively until he was great. The problem is, the story is apocryphal. Jones actually threw a cymbal on the ground, “gonging him off” when Parker failed to change key with the rest of the band. Not everyone agrees that musical genius results from constant practice, but it is true that even the greats, like Sonny Rollins, do a lot of woodshedding. 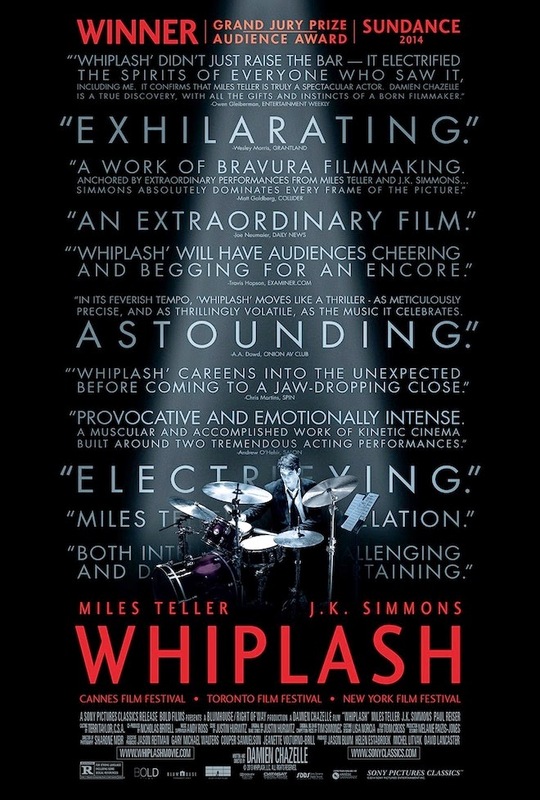 A quote from a New Yorker review I haven't read says that this movie serves neither jazz nor cinema. As for jazz, I agree that the traditional, straightahead jazz showcased in the movie, whose actually a Frank Zappa punchline ( “'Caravan' with a drum solo'”) — is a little vanilla for fans of modern and avant-garde jazz, or any jazz after the 1950s. One of the carrots Fletcher dangles before the student players is the prospect of being hired by Lincoln Center, that mausoleum of Wynton Marsalis traditionalism. About the lionization of Buddy Rich, one wonders, are the filmmakers conscious of the parallel between Rich's notoriety as a tyrant bandleader and Fletcher's brutal behavior? Among drummers, Buddy Rich was a legend, but so were Elvin Jones and Tony Williams and Art Blakey. A Buddy Rich quote is displayed in the film: “If you don't have ability, you wind up playing in a rock band.” Too bad he's not alive for Ginger Baker to bash with his cane. As for cinema, the movie is essentially a duet between Simmons and Teller, a raw, propulsive, visceral experience. Perhaps because it was expanded from a short, the movie wanders into the realm of improbability, including a traffic incident I won't spoil your experience by describing. Setting aside the implausibilities, "safe" Ken Burns-approved jazz and ambiguous message about the pedagogic value of cruelty, it is a very watchable, provocative film certain to spark discussion. 3 1/4 out of 4 stars.